Viacom (NYSE:VIA) had a better-than-expected fiscal 2017 (fiscal year ends September 2017). For the fiscal year, the company’s total revenue increased 6% year-over-year (y-0-y) to $13.2 billion, due to growth in both the Media Networks and Filmed Entertainment segments. The company’s top line growth was driven by a 2% y-o-y increase in affiliate revenue, 1% y-o-y growth in advertising revenue and strength in the company’s international operations in Media Networks, along with a stronger film slate at Paramount studio. 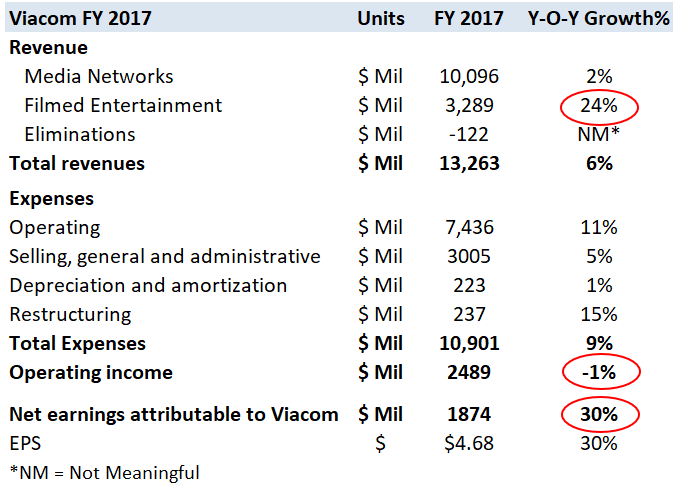 In fiscal 2017, Viacom generated $1.5 billion of operating free cash flow, up 26% y-o-y, driven by improvements in working capital at Filmed Entertainment, including lower film spend, partially offset by higher cash taxes. In addition, the media company’s selling, general and administrative (SG&A) expenses increased 5% y-o-y due to higher segment expenses. From a bottom line perspective, the company’s net income grew 30% y-o-y to $1.8 billion in the same period, translating into earnings of $4.68 per share. However, the company’s stock fell 17% in fiscal 2017, and is almost down 25% year-to-date (YTD). This is due to the fact that the company reported a modest decline in subscribers in the U.S. throughout the fiscal year. To add to that, the stock also declined on the company’s announcement of lower anticipated revenues from cable and satellite companies in 2018. Cable provider Charter Communications moved six popular Viacom channels to its highest-priced subscription tier, which likely resulted in most of the subscriber declines. However, Viacom reached a new agreement with the cable provider last month, which led Charter to put the company’s networks – including Nickelodeon, MTV and Comedy Central – back on Charter’s basic tier Spectrum Select. We expect the agreement to help Viacom offset some of the subscriber declines by the end of fiscal 2018. Viacom’s Media Networks revenues increased 2% y-o-y to $10 billion in fiscal 2017, primarily due to a 2% y-o-y increase in affiliate revenues and a 1% increase in the segment’s advertising revenues. However, Media Networks’ adjusted operating income declined 5% y-o-y due to investment in programming and employee costs. Media Networks witnessed a 1% y-o-y increase in domestic affiliate revenues and 6% y-o-y growth in international affiliate revenues, driven by rate increases and higher revenues from subscription video-on-demand and other OTT agreements. On the other hand, the segment’s domestic advertising revenues declined 2% y-o-y, reflecting higher pricing, more than offset by lower impressions. Its international advertising revenues increased 22% y-o-y due to a favorable impact from the Telefe acquisition, as well as growth in Europe. Viacom’s Filmed Entertainment revenues in fiscal 2017 were up 24% y-o-y, principally due to a strong 34% y-o-y increase in its theatrical revenues. The company’s theatrical revenues grew to $808 million, driven by the box office release of Transformers: The Last Knight. However, the segment also generated an adjusted operating loss of $280 million in the period, due to higher print and advertising costs related to the theatrical releases. Although this segment is responsible for only 20% of the company’s revenue, the multi-year agreements and initiatives from China could help the company stabilize its Paramount revenues going forward. In fiscal 2018, Viacom expects continued pressure on domestic affiliate revenues, driven in large part by rate resets, lower SVOD revenues and subscriber declines. 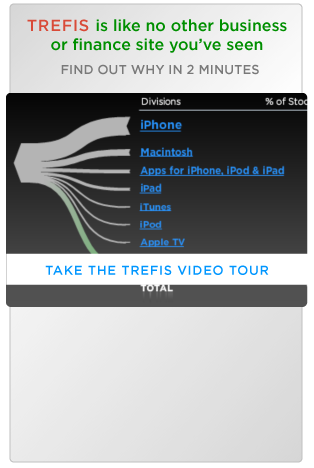 As of international affiliate revenues, the company expects it to continue to grow. The company also expects its Media Networks programming expenses for 2018 to be in the low to mid single-digits, due to continued investments in its flagship networks. The company is targeting approximately $100 million in cost savings in fiscal 2018, most of which will be realized by fiscal 2019, which will drop to the bottom line. Accordingly, fiscal 2018 Media Networks SG&A expenses should improve by low single-digits driven by these cost initiatives, if they come to fruition.